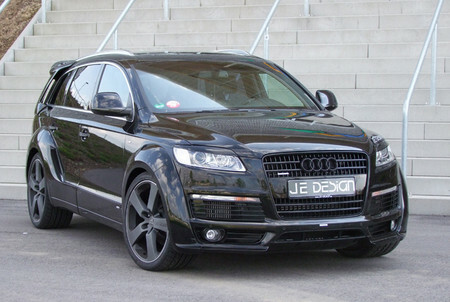 JE Design released a new kit for Audi Q7 S-Line, this time it’s a wide boy kit which also comes with a number of other sporty parts, and it’s overkill really! At front not only you get a front spoiler and new lights plus a blacked-out grille, there is also new headlight bezels for a more aggressive presence. At each sides you obviously notice the massive fender flares with matching door panels and side skirts, and at the back , you get four tailpipes, a diffuser and a roof spoiler. As for the wheels you get the set of five-spoke 22-inch alloys available in different colors including black, silver and gloss and matte graphite. They come with a complementary suspension lowering module. And while JE says there’s performance upgrade as well, they don’t give any details on that front!